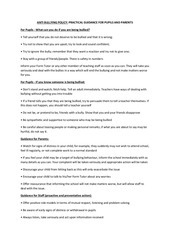 This PDF 1.5 document has been generated by Microsoft® Word 2010, and has been sent on pdf-archive.com on 20/05/2016 at 12:36, from IP address 188.246.x.x. The current document download page has been viewed 179 times. complaints policy, you do not have to adopt this LTA policy, but it might give you some ideas. 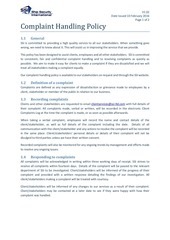 Why have a complaints policy? members and customers and can encourage members to feel confident and safe. available both to clubs and to individuals in case serious problems arise. How do we put the policy in place? that understand this usually find it easier to put in place the detail of their policy. they decide to speak out. This is especially important for children and other vulnerable adults. should be given the opportunity to respond in detail before any decision is made. Try to avoid having important decisions about a complaint taken by a single individual. concerns. Deal with each issue clearly and separately. If a complaint suggests that someone’s safety or welfare could be at risk, make those issues a priority. allow these to overshadow the important things. your right to seek advice or support in some cases, and more information about this is included below. Although you should deal confidentially with complaints, you are still able to seek advice and support. In fact, there are some situations where you have an obligation to discuss your concerns with others. not able to contact them, your local social services, the Police, and the NSPCC can all offer advice. that you have information that could stop another crime from being committed. complaint directly, but can offer advice and support about handling the case. on a wide range of practical and policy issues. the details of a person to contact about the progress of their complaint. should think about the welfare of the complainant. Making a complaint can be worrying and stressful. you think that more specialist support is needed, consider seeking advice (see above). ‘confidentiality’ of your investigation. Try to keep your investigation relevant. group of senior officials involved in the decision. would put someone at risk. In this case, seek advice (see above). you take action against a member of staff. 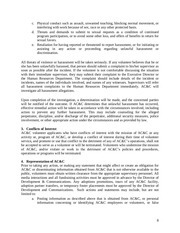 information about formal action against a child unless the child and his or her parents agree to this. This file has been shared by a user of PDF Archive. Document ID: 00374599.